Gwynneth Reese is a young lady living with her childhood friend Seth. She is recovering from a bitter break with her boyfriend and decides she needs a change of scenery. In that change from being a painter she took a job at a local retirement home. An emotional wreck on her way home during a thunderstorm in the area, Gwynn is struck by lightening. This is a different kind of ghost story. The characters were enjoyable to read about but also had weird characteristic that brought interest to the story. Gwynn is going through all this but is being so secretive. Seth cooked through out the entire book but found it hard to express his feelings for Gwynn. Fenton, Gwynn’s co-worker and friend, I like his humor and I truly understand why he was a sucker for a free meal. Who can turn down good cooking? Dante was a weird funeral home guy that played his stereotype creepy part very well. Great characterization on the part of the author. The story had my interest as in I wanted to know what would happen but it wasn’t one I couldn’t put down; more like I did a sigh when I saw I still had quite a bit left. I give the author praise in the details in letting the reader know the scenes and the visual view of the characters and also praise for storytelling but a minus for not telling the details of the story where it counted or needed details to give the story balance. Like for example how did Julian come to be? What brought him to Gwynneth and I never could understand what was it he or the shadows wanted. After reading the ending I felt cheated as a reader. Gwynn closed the port. Where are the details of how she closed the port? The author has giving minimum details of trips taken with Julian but then to close the book there is only telling and no action of how Gwynn ends all this fiasco. Don’t get me wrong this is an original plot for me and I was excited to read it but it didn’t keep the sizzle. Another point that stands out is the translator translated Hannah’s diary but then call Gwynn back to tell her more. Was the diary a series? It just seemed out of place to call Gwynn a second time after he already translated the diary. Julian I couldn’t figure out; the shadows either. I was left at the end wondering what was the point or reason of Julian and the shadows. The plot, set-up, the writing all were good and helped me finish the book but there was just too much left missing to give it a higher review score. 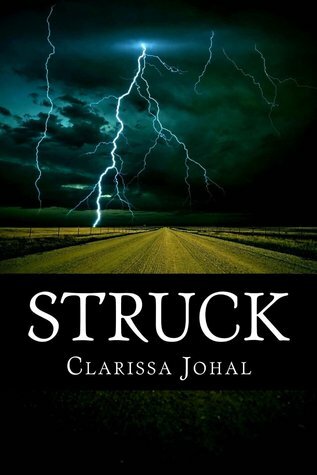 Struck is an original story that is well constructed, where the author displayed good writing skills and a talent for telling a good story. A creepy, alive story, it is that will have you looking over your shoulder and under your bed. This entertaining and vibrant story includes interesting characters as well as showcases many sweet and caring relationships.